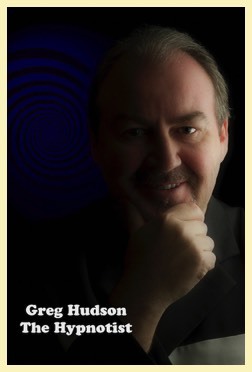 Greg Hudson Comedy Hypnotist Make your next event unforgettable! Greg Hudson is a talented performer with an engaging personality who has worked in a wide variety of venues throughout Australia and New Zealand. He has hypnotic entertainment available for all ages and occasions from family shows to corporate functions. 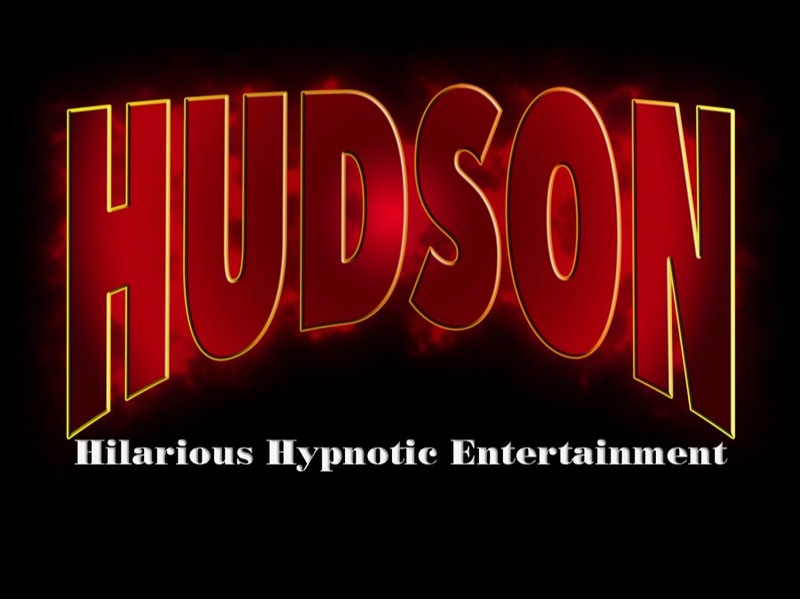 Hudson's "Hypnotic Show" is all good clean fun, suitable for all ages. He treats his volunteers with the greatest respect and endeavours to give them an uplifting experience not a degrading one. 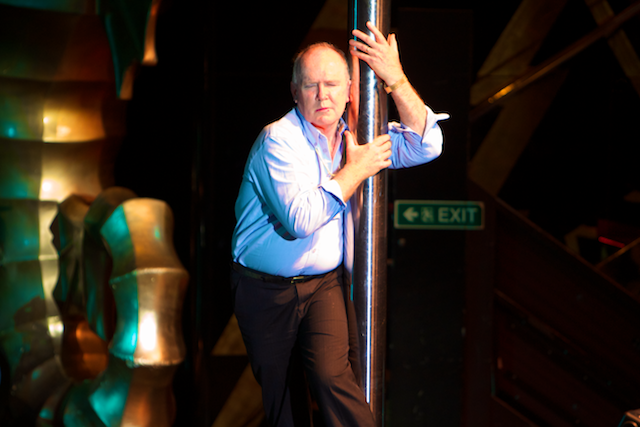 If you're looking for a night of fun, laughs and amazement this show is sure to fit the bill. Hudson has worked at many of Sydney's leading hotels including The intercontinental, The Regent and The Ritz Carlton to name a few. Hudson is also in demand on the high seas where he has worked regularly over many years for Sitmar, P&O, Norwegian Capricorn and Princess lines of ships. 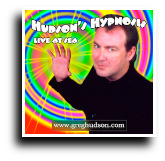 Whether it be for family groups or corporate executives you can be sure "Hudson's Hypnosis" will be an entertaining and unforgettable event. Greg your performance was truly fantastic! You had our franchisee's and guests in total amazement and fits of laughter. You are by far the most hilarious act we have ever seen and a great hit with everyone. The word on the street is for the funniest night you will ever see contact Greg Hudson. Once again Greg thanks for an amazing show. Fantastic show at the Printing Industries Craftsmanship Awards in Western Australia. Many thanks Greg, people are still talking! What a way to Kick off a meeting! The audience couldn’t believe their eyes as Greg showed a different side to each of the volunteers! Everyone said it was a great night and they all enjoyed it immensely – they are still talking about it! "It was a wonderful choice asking you to perform at our conference, the audience enjoyed the show and were totally absorbed in your performance. Your show was all that anyone was talking about the next day; it is still a topic of conversation in the office now! Everyone loved the show & I would not hesitate in recommending you to anyone that asks. You are a real showman!" "Having worked on many ships over the years I can honestly say that your show is one of the funniest and most entertaining that I have seen. This view is obviously shared by the passengers who talk about your show long after it has finished. They also consistently rate you very highly on the passenger comment cards. Comments such as "amazing, incredible, truly unbelievable, I've never laughed so hard" seem to be the norm for your show." Greg was excellent. I and many others were sceptics but we are now all believers. He made the audience laugh & cry (out of joy). I have never had so much fun at an event. Thank you once again for being so professional and catering to a corporate audience. The show was fantastic. Everybody had a wonderful time. We all laughed all the way through. We are still talking about it. "Thoroughly Entertaining! Great to see everyone engaged in the show whether they were participating or simply on the edge of their seats & captivated. We haven't stopped talking about you since." Just wanted to let you know that everyone thoroughly enjoyed your show. You truly amazed and entertained our audience and left them with a real happy belly ache from all the laughter! Entertaining program from a truly professional performer that is down to earth and easy to deal with - what else could you ask for? "Greg's performance was fantastic, even the sceptics were amazed! Greg read the audience extremely well. It was a highly entertaining evening with everyone relaxed and having fun." The Show That Sends Them to Sleep! Hudson's Hypnotic Show is the perfect entertainment. It combines mystery, comedy, music, sound effects and audience participation into one complete package. 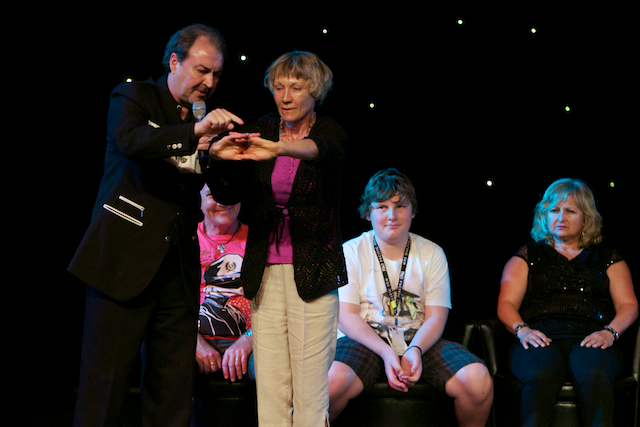 Comedy hypnotist Greg Hudson takes volunteers from the audience and transforms them into star performers using the powers of suggestion. Imagine the looks on your guests faces as their friends and colleagues perform in amazing and unbelievable ways. They will take on the persona's of famous people, go back in time to when they were young children, visit an alien planet, get drunk on water and much much more. Your audience will be fascinated by the power of the mind and will talk about this event long after it is over. Both the audience and the volunteers will have the time of their life, for the audience it is fascinating, hilarious entertainment. The volunteers will find it a relaxing, fun filled and unforgettable experience. The members of the Penrith & Districts Basketball Association have not stopped talking and laughing about the hypnosis show. Many could not believe how you could get people to be under your control so simply and quickly, and their antics amused the group for the whole evening. Thanks for a great night and we hope to do it again. The feedback I have received over the weekend has been overwhelming. Everyone had such a great time. The comments that I have received so far have been along the lines of "I have never laughed so much in my life", "it was the most amazing thing that I have every seen", "I am so glad that you made me go because it was one of the best nights out I have ever had. What can I say? What a great night of entertainment. On behalf of everybody who attended, Thanks again for a great night and we will do it again. Greg's show was just amazing. I dont think I've ever laughed so hard. Feedback has been fantastic. Everyone that attended had a great time and thought Greg's performance was awesome. It was a fantastic show that was enjoyed by players and supporters alike. The comments I received after the show were all positive and even the "sceptics" could not believe how funny and entertaining the night was. Greg was professional and friendly and made organising this event a breeze. I was delighted to watch you gain the confidence of the audience, fill the stage with volunteers and then provide an hour and a half of outstanding entertainment. The smiles and laughter throughout the show evidenced the enjoyment of the audience. Every person present enjoyed the show immensely and I have had many telephone calls of congratulations since. Once again thank you for your contribution to making our night a huge success. Did we enjoy the show? People were coming to me saying it was the best entertainment and laughter hey have had for a long time. One person said she laughed so much her body was aching. It was great to see everyone leave with a smile. People were still talking about it days later. A huge thank you for a fantastic show at the Harden Country Club. Everyone had a ball and laughed til it hurt. Word has spread and many are asking when is the next show? It was a fantastic night, easy to organise and you did a wonderful job. Thank you for a wonderfully entertaining evening. I haven't laughed so much in a long time- my stomach muscles ached for days. People are still talking and laughing about the hilarious situations you created. Everybody has the ability to be hypnotized. However nobody can be hypnotized against their will. It is up to the individual to "make it happen". WHO HAS CONTROL OF MY MIND? You have full control of your actions and mind. The hypnotist is there to help you reach the trance and orchestrate the performance. Nobody can take control of your senses, you will be fully aware of everything you do. Most important of all, you will really enjoy the experience. 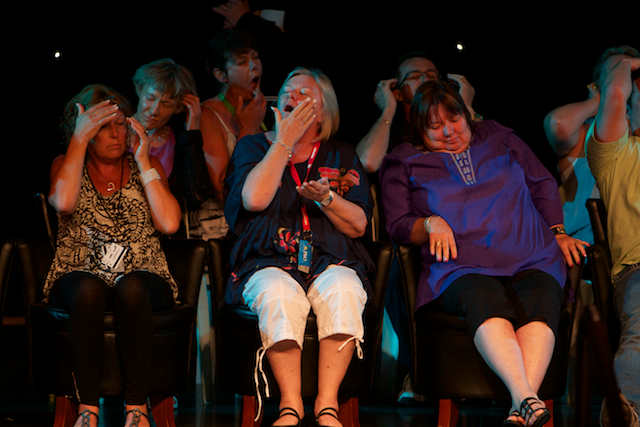 Hypnosis is a very relaxed state of mind. It is naturally occurring and you have probably experienced the trance state while being engrossed in a TV program or while driving long distances. If one reaches only a light trance then the feeling may be no different to relaxing in a comfortable chair. The deeper trance can be almost euphoric. What a tremendous night! People are still talking and laughing about it. A truly great gift is to make people laugh so much they have tears rolling down their face! I very much appreciate Greg's professionalism and ability to deliver the entertainment with a minimum of fuss. The night was fantastic and the positive feedback has absolutely blown me away. Everybody, including all your wonderful "subjects" had a wonderful time. This has definitely been the highlight of our year and we look forward to seeing you again. Thanks again for your entertainment. My guests thoroughly enjoyed your show, and the only complaints I have had is that there were a few sore jaws (including mine) around Canberra from continuously laughing at your show. Thanks again. Thank you for an unbelievable night. Your show was extremely professional and you made it as easy as possible to organise. Everyone was "blown away" and as with me hadn't laughed so hard in years. FANTASTIC!!! The feedback is still coming in 2 weeks later. All I get is WOW what a funny night. My cheeks ached from laughing. Greg Hudson Hypnotist. Make Your Next Event Unforgettable! Do you have trouble relaxing? Always stressed out? Find it hard to relax? Due to numerous requests I now have a relaxation CD available to help you out. Experience the benefits of deep hypnosis relaxation in the comfort of your own home.